Click on the "Fields" tab in the backend of the component. You can see all default fields and whether they are required when writing ads. Below we will see how to add custom fields. Click on the "New" Button and read details of the form down below. Search options means the field will be used in the search module with SimpleSearch or AdvanceSearch depending on your AdsManager pack. Check out the features documentation for more information. Use as Profile means this field will be considered as a field in Community Builder. 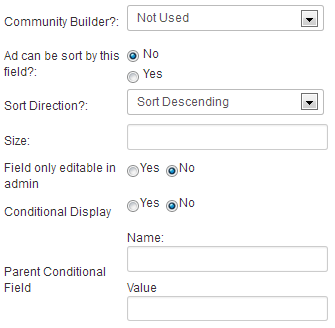 You can choose whether to use Community Builder or not if applicable. Everything works fine without Community Builder, we provide a simple interface to manage profiles of your users. 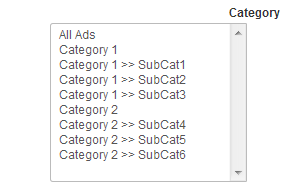 You can choose to let users to sort your ads by a field if you select yes and to choose the sorting directon. Size is the size of the field, such as "50" . You also can choose whether you allow a field to be editable in the front-end or not. Your ad is in a category, let's say, "Automobile/Boats", and assume that there will be different fields for automobiles and boats. If you want to show certain relevant fields only when in the boat category, you can do so using conditional fields. Here an example of conditional fields. The parent field doesn't need a special configuration. Once you've created the parent field, you need to create a new field, this one will be set to be displayed only if a specific value of the parent field is selected. Set 'Conditional Display' to Yes and specify which values of the parent field will cause the current field to be displayed. Tips : You can associate any fields like the two above and customize your ads form like you want. In the options of the field, you need to specify the name of the parent field. 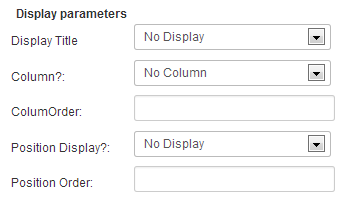 In the value field, you need to specify the value that will trigger the displaying of the conditional field. Select which categories you want your field to appear. You can chose All Ads to select them all. You have two way to add options to dropbox fields. If you select the "Data stored in Adsmanager" option, you can fill the empty fields below in order to add options to the dropbox field. Clicking on the 'Add a value' button will add new empty fields. If you select the "Data stored in an external table", you just have to specify into which database table and columns. 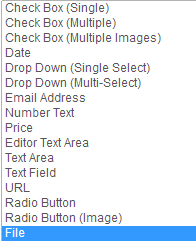 The options list of the dropbox field will be filled with the content of the table. Cascading fields are a special type of field available with AdsManager Silver or Gold pack. This allows for the content of fields to depend on another. For example: you have two dropdown lists where users select a country and then a city. With cascading, when the user selects a country the list of available cities changes to match the selected country. First, create the drop down parent field that will contains the parent values. Then, Create a new field and select the type 'Cascade' in the list. Then, you need to set the values of the field to cascade on, you can fill these values the same way as you would for the parent field. The parent column need to be filled with one of the value of the parent field. When displayed, the values displayed in the list will be filtered using the parent value, so the parent value must exist in the parent field, otherwise, the value will never be displayed. Tips: It is not mandatory to assign all the parent field values. If a prent field value doesn't have any child, then the cascade field will be disabled for this value. The option in the price allow you to specify the currency you want and the range of the price search field. 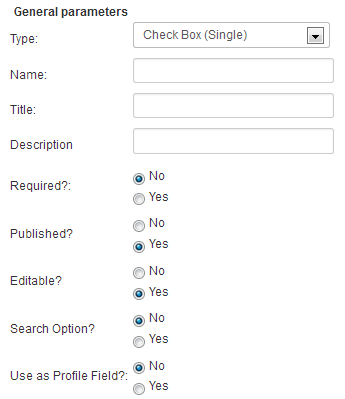 This fields allow you to set the available price range you want to display in the search form. You need to fill the left column with the display value and the right column with a value formatted like the screenshot.